The fact is that I really want my children to be more techie than I am. I think it’s important in this time, and will be even more so, in their future. It seems to take me forever and a day to learn something new when it comes to the computer, so I know I’m not equipped to teach them Computer Science. As a homeschool parent/teacher, I learned long ago that I don’t have to know everything. I just have to know how to find the resource and make it available to my child. Homeschool Programming, Inc. is my resource. They had me with their home page Welcome! and this description: “Our computer programming courses for kids and teens teach students to write programs, games, and Android applications! No teacher expertise required! All of our award-winning computer science courses for Visual Basic, C#, and Java are self-study,” and they’ll keep me because I think their TeenCoder C# Series lays an excellent Computer Science foundation for my high school student. I had the opportunity to use TeenCoder C# Series with my son, a high school junior. It’s designed for 9th – 12th graders, so I expected it to be a good fit for him. I wasn’t disappointed. He’s had no previous programming experience, but he’s familiar with navigating Windows on our PC. That’s really the only requirement. TeenCoder C# Series is divided into two stand alone courses, each a full semester of work. One semester is spent on C# programming skills – Windows Programming, and another semester covers writing graphical computer games – Game Programming. Together, they fill the need for high school Computer Science credit. Included with each course is a Student Textbook e-book, and a Teacher’s Edition, that mainly gives me a synopsis of what my student is working on. 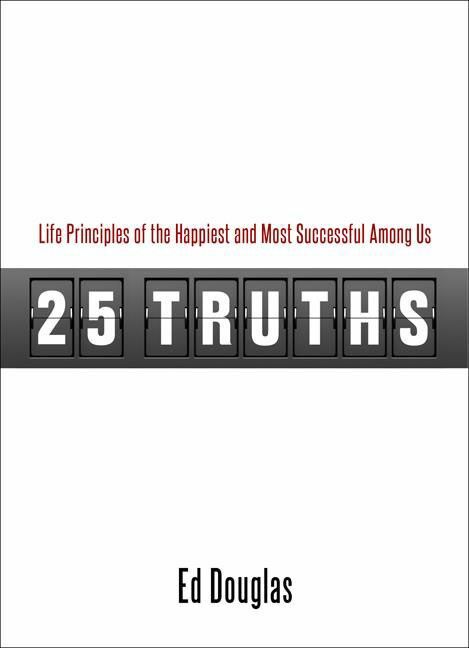 There are also chapter tests/answers in PDF format. The Student Text is written to the student. My son says it is “interesting and easy to follow.” I’ve stood over his shoulder a couple of times, out of pure personal interest; but thankfully not because he needed my help with anything. We’ve found there’s truly no teacher experience or prep needed. It’s not that he understands everything the first time he reads it, but he can read it again and follow the clear instructions. Everything necessary to his success is included in the teaching. The first chapter begins with the most basic step and builds a step at a time through the final chapter. Thorough, detailed instructions are given with each lesson, and for audio-visual learners, additional Instructional Videos are available, to be used in conjunction with the Student Text. They work well for reinforcement and clarification, but they are not as complete as the written instructions. We did find them helpful on occasion, but unnecessary for every lesson. Once he read a lesson, I let my son decide if he wanted to watch the video that accompanied it, or not. A hands-on project or Activity is assigned at the end of each chapter, with a final project due at the end of the book. These are the best part of the course, as far as my student is concerned. They challenge him, but then affirm that he’s learning the language and learning to program. He hasn’t reached his final project, yet — designing a graphical chess game — because he’s in Canada with our church’s mission team; but he’s excited to complete it and see what his dad and sister think of it. They play against each other at least 3 or 4 times a week, so they’ll be good judges of his design. 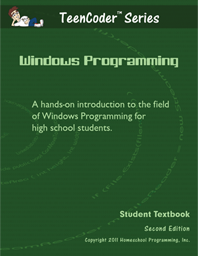 The Game course builds on Windows Programming. It’s the next logical step, and Windows is actually a pre-requisite. It is set up the same way as Windows, with lessons, followed by activities. We haven’t even started Game Programming, but the cool thing is that an interest is already sparked in my son’s mind. Whether or not he pursues Computer Science beyond high school, I think this course will benefit him. At the moment, he just thinks it’s fun and it takes up a space on his transcript. My view — I’m from the “knowledge is power” generation, so who knows where this might take him. 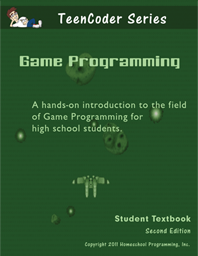 If you’re interested in a few other view points, you can click the banner below and follow the link to read reviews from my Crew mates on this, TeenCoder C# Series, and other products from Homeschool Programming, Inc.
Windows Programming and Game Programming can be purchased separately, for $75. each; or as a Year Pack for $130. for both courses. The Instructional Videos are $20. each and are not a required purchase. I am more than satisfied with this product and plan to use it with my other children. I’ll have a new freshman next year, so I’ll write an update on how she navigates the program. Disclaimer* I received the TeenCoder C# Series, in exchange for my honest review as a member of the Schoolhouse Review Crew. I receive no other compensation for my reviews on this blog. The opinions expressed are my own.